Aids function for maintaining cognitive health, a fast metabolism, strength of muscles, strong bones, youthful skin, and healthy tissue. K·REAL® krill oil derived from Antarctic krill is extracted using a clinically-proven technology to enhance bioavailability and absorption. The Multi-Stage Oil (MSO®) extraction technology uses several proprietary processes to ensure freshness of oil, as well as improved quality, purity, and consistency. 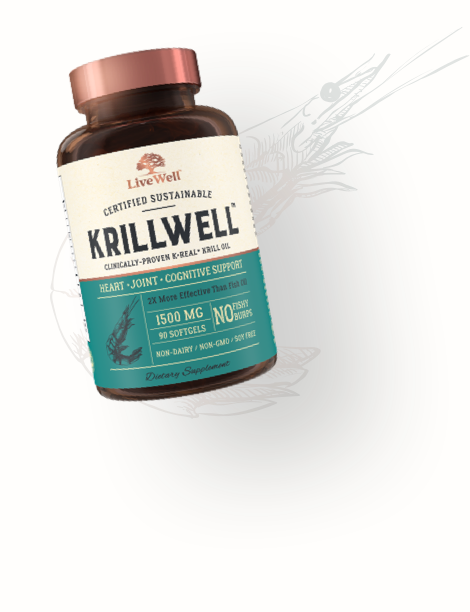 This potent krill oil contains omega-3s, which provide numerous health benefits, from improved cardiovascular health to decreased symptoms of arthritis, such as soreness and discomfort. 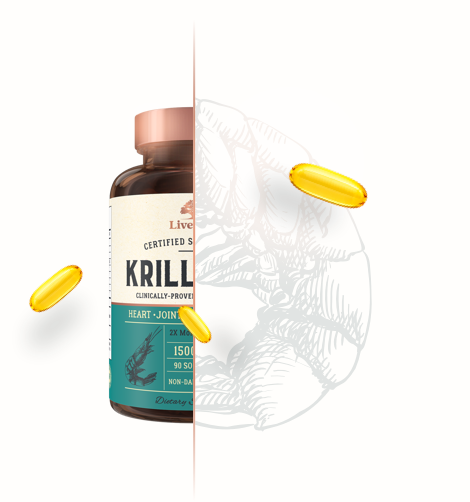 Krill oil is naturally comprised of EPA (eicosapentaenoic acid) and DHA (docosahexaenoic acid), long-chain omega-3 fatty acids that work in combination to address autoimmune diseases, brain health, heart problems, and many other conditions affecting your health. Krill oil also contains astaxanthin, a potent antioxidant, more powerful than vitamin E by about 550 times and 6,000 times more potent than vitamin C. This carotenoid has numerous unique properties, including its ability to neutralize free radicals, helping to prevent cellular damage. You can rest assured knowing there are never any harmful fillers or additives, just whole, natural ingredients. ** Percent Daily Value based on a 2,000 calorie diet. *These statements have not been evaluated by the Food and Drig Administration. This is not intended to diagnose, trat, cure, or prevent any disease. Our entire line of natural products are proudly manufactured in the USA, employing stringent quality control standards that exceed expectations set by cGMP (Current Good Manufacturing Practices). We double down on our commitment to truth in labeling, ingredient safety, and product potency with independent, 3rd party testing, giving you peace of mind that what's on the label is also what's inside the bottle. In the interest of transparency, we never use incentives to influence these reviews. Thank you for your reviewing our product! The information contained within this site is not intended as a substitute for professional medical advice. If you have, or suspect to have any medical condition you are urged to consult your health care provider. These statements have not been evaluated by the Food and Drug Administration. This product is not intended to diagnose, treat, cure, or prevent any disease. Medical conditions can only be diagnosed by a licensed medical physician. ©2019 LiveWell Labs | All Rights Reserved.